Use your imagination to add spices and flavorings to this basic salmon jerky recipe. The jerky may be made in a dehydrator, smoker or oven. Plan ahead as you will need up at least 8 hours of marination time, and it may take up to 8 hours or more to achieve the desired doneness. Place salt, brown sugar, soy sauce and water into a pot. Next bring that to a boil and stir until the sugar has dissolved. Remove the pot from heat and let cool to room temperature. Slice the salmon lengthwise (not across the width) into strips 1/4- to 1/2-inch thick. Place the salmon strips in the cooled brine and refrigerate for 8 to 10 hours to marinate. Drain the brine. Rinse the salmon with clean water and let drain. Pat dry with paper towels. Spray dehydrator racks with vegetable oil. Place salmon strips on racks, not touching so air can circulate. Sprinkle with cayenne pepper to taste. Dry to desired doneness according to dehydrator manufacturer's recommendations. 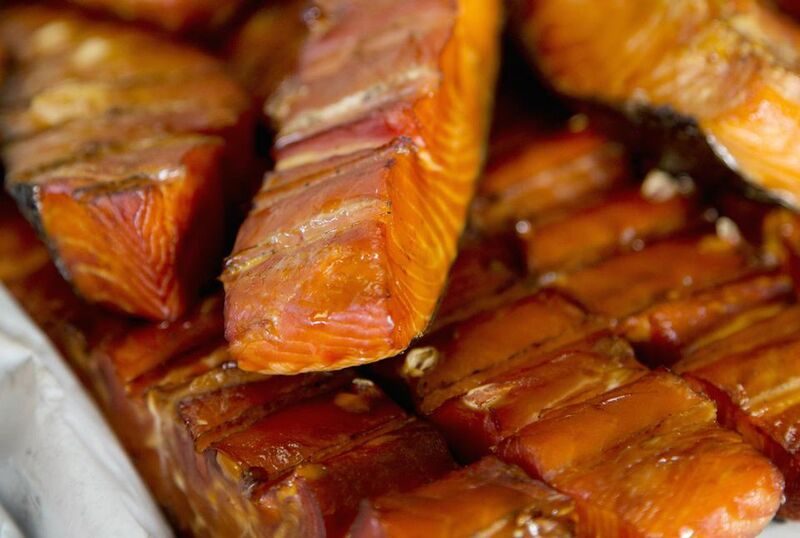 The salmon jerky may also be dried in the oven on its lowest setting or in a smoker. The drying time could take 8 hours or more, depending on the method and how dry you like the jerky. Store salmon jerky in an airtight container or ziptop bag.